The Common barn owl is Tyto alba, a species of owl in the genus Tyto. It is the most widely distributed species of owl, and one of the most widespread of all birds. The barn owl family Tytonidae is one of two main lineages of living owls, the other being the typical owls (Strigidae). It is known by many other names in different parts of the world, which is one of the problems with 'common names'. It is one of the main reasons Linnaeus invented his system of scientific naming. This owl has long wings, a pale face, and a square-shaped tail. It lives in rural areas like farms and woodland. The barn owl has a wing span of 75–110 cm and its body length measures up to around 25–50 cm. It weighs between 187 and 800 grams. Barn owls' breeding season is spring and it breeds in nests in trees. It eats small mammals, reptiles, fish, insects and smaller birds. Tyto alba is nocturnal, as usual for owls. However, it often becomes active shortly before dusk and can sometimes be seen during the day, when it moves from a sleeping place it does not like. This is a bird of open country such as farmland or grassland with some interspersed woodland. This owl prefers to hunt along the edges of woods. It has an effortless wavering flight as it moves over pastures or similar hunting grounds. Like most owls, the Barn Owl flies silently; tiny serrations on the leading edges of its flight feathers help to break up the flow of air over its wings, thereby reducing turbulence and the noise that accompanies it. It hunts by flying low and slowly over an area of open ground, hovering over spots that conceal potential prey. They may also use fence posts or other lookouts to ambush prey. The Barn Owl feeds primarily on small vertebrates such as rodents. 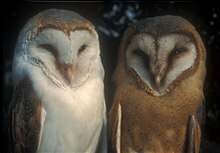 Studies have shown that an individual Barn Owl may eat one or more rodents per night; a nesting pair and their young can eat more than 1,000 rodents per year. Locally superabundant rodent species in the weight class of several grams per individual usually make up most of the prey. Such animals probably make up at least three-quarters of the biomass eaten by each and every T. alba, except in some island populations. 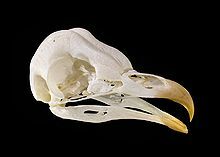 In Ireland, the accidental introduction of the Bank vole in the 1950s has led to a major shift in the Barn Owl's diet: where their ranges overlap the vole is now by far the largest prey item. The diet is supplemented with local small vertebrate and large invertebrate life. ↑ Kelleher, Oliver and Sleeman 2011. Irish Birds Volume 9. This page was last changed on 8 December 2018, at 00:44.